Game Ready unlocks the tools every player, on and off the field, needs to achieve success. Whether you're coaching and training athletes or leading a dynamic team in business, Coach Mickey Marley has cleverly distilled the key components for everyday victory into what he calls 52 Takeaways for Winning. Short, concise, and practical, every takeaway addresses the pitfalls that stand in the way of coaches or leaders creating a successful team. In this book, team members will hear the distinct voice of a former player who became a respected coach, a voice they will want to take into their future endeavors. In Takeaway #30, No Excuses, Marley challenges readers in his no nonsense-style to take responsibility for their performance. 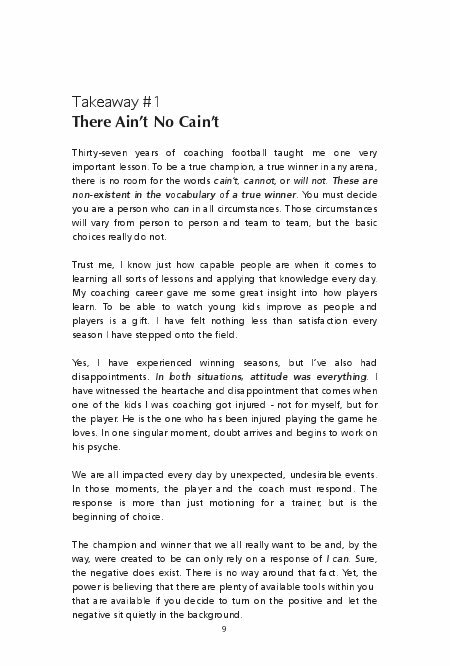 In Takeaway #46, he candidly captures every player and coach's surest road to defeat as he urges maintaining a healthy self¬-worth in Don't Beat Yourself. His passion for the game of football is the thread that weaves his spirited essays, from Takeaway #38, Football, the Great Equalizer to Takeaway #24, God, Family, Football. Crafted for men and women, players and coaches, and anyone who truly desires to succeed in their chosen field, Game Ready offers real opportunity for personal growth using lifelong principles too often overlooked. Coach Marley is a native son of Tennessee with a keen understanding of people and what motivates them to excel. Game Ready is his first book. In Game Ready, 52 Takeaways for Winning, author and football coach Mickey Marley, reveals the keys to cultivating talent, instilling teamwork, and creating a clear path to victory. Coach Marley instructively shares what he has learned from thirty-seven years of coaching, mentoring, and teaching young athletes. Each chapter, or takeaway, creatively addresses a challenge or weakness faced by coaches and players, even managers and professionals in the workplace. 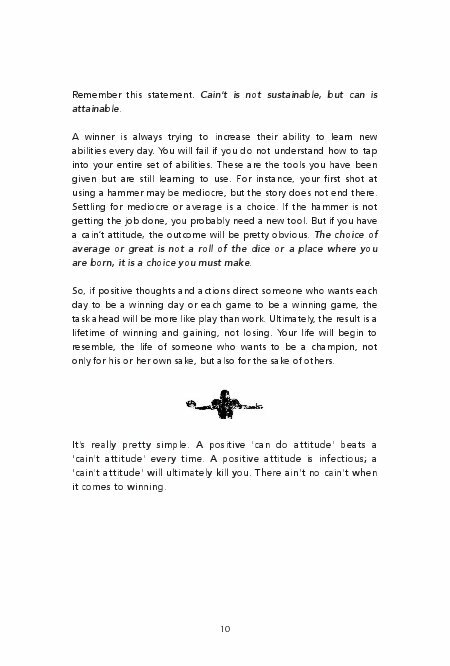 Each one of these 52 Takeaways for Winning is designed to stand alone. They also fit neatly into a larger strategy for personal success that Coach Marley learned from his family, his coaches and his lifelong career in football leading athletes to victory. On every page, readers receive usable insights that can easily be put into practice on and off the field. In his folksy and candid style, Coach Marley tackles a variety of tough subjects, but always emphasizes just how simple victory can be when your Game Ready! Mickey Marley is a respected Tennessee football coach, earning the distinction of being named to the Tennessee Football Coaches Association Hall of Fame. During his 37-year coaching career, he has consistently earned the acclaim of his peers. He has been selected TSSAA District Coach of the Year twelve times and has been presented the All-American Football Foundation High School Coach Award. Coach Marley's career began at his alma mater, the University of Tennessee at Martin, and continued for thirty years at the high school level where he gained his winning reputation at University School of Jackson. Today, he continues leading the sport he loves as Head Coach at Rosenwald Middle School in Trenton, Tennessee. Off the field, Coach Marley enjoys speaking and participating in numerous football player and coaching organizations. His true passion is his family. He and his wife Lisa reside in Jackson, Tennessee. They have two daughters. Jordan, is a graduate student at Mississippi State University. Kristen and husband, J.P. Harrison, have three sons Jack, Eli, and Charlie Harrison.